This book began as a sermon in front of a congregation of 3,000 people. More than 900 requests poured in for copies of the audio message! From pastors to prison inmates people are testifying how God is using this message to set them free from this subtle form of idolatry known as the fear of man. The fear of man is what kept the Israelite’s from entering the Promised land. 1 Cor. 10 tells that these things were written for our instruction and for our example. God did not want the church to make the same mistake and miss the blessing. Sadly, most of us are missing the blessing! 1. The Christian’s Are Here Call Out The Lions! 2. What Does a 3,000-Year-Old Uncircumcised Philistine Have to do With Me Anyway? Part three / How do I Get Delivered? Jesus said, “If you are ashamed of Me before men, I will be ashamed of you before My Father in heaven.” We will never experience the joy and the power of intimacy with God as long as we are bound in the idolatry of pleasing men more than God. One of the main reasons we do not experience the joy and the power of God in our lives is because of the fear of man. “Remember the revival God brought through David Wilkerson working with the gangs in New York City and Nicki Cruz? Philip DelRe has been working with gangs in prison and by God’s grace has led thousands to the Lord! You want to bring a dynamic speaker to your church? Call Phil DelRe! His new book, The Fear of Man Vs. 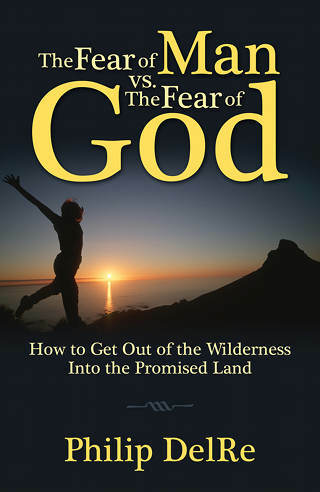 The Fear of God is a must read”! Phil DelRe powerfully communicates the Gospel and overflows with a passion to reach the lost. His message on the Fear of Man Vs. The Fear of God is a powerful, powerful, word from the Lord and I thank him for it! DR. ROBERT COLEMAN, DIRECTOR FOR THE SCHOOL OF WORLD MISSIONS & EVANGELISM, FOR BILLY GRAHAM ASSOCIATION AND AUTHOR OF THE BEST SELLING BOOK, THE MASTER PLAN OF EVANGELISM. Until then, I did not realize how the fear of man had subtly influenced my decision-making process, sometimes intimidating me from boldly doing what I knew to be right. Likewise, I realized I had become desensitized to the fear of the Lord. I mention the decision-making process because part of what I do is make important decisions that affect the lives of others. I am a Judge in a Criminal Court in a large city and have to make important decisions everyday that affect the lives of many. In the criminal courts, due to the sheer volume of cases and limited resources, I seldom have all of the information I might wish and have to make life-impacting decisions anyway. Now, I pray through Proverbs 29:25 before every major decision. I ask God to purify my decision-making process so that it is untainted by fear of man or approval seeking. I ask God to instill in me a holy reverence for Him and to do His will without fear and to serve Him and His purposes in this decision. Guided by these principles, I pray over the court file and the defendants and victims and families lives the file represents. I then render a decision that is fair and just under the law and the evidence without considering the approval of others or fear of others. Thank you for distilling down these important truths into a readable, well illustrated, easily understood format. May you boldly and courageously serve Him until His return. Philip DelRe, a man with a great ‘what Jesus did for me’ story and a man with a great message from God’s Word. Phil preached here in Chicago at Armitage Baptist Church. His message was Biblical, simple, direct, and delivered with earnestness. This man has a knack for holding people’s attention. This book, God the Final Frontier is written by a man who’s got his stuff together. My friends and I went to the Iron Sharpens Iron conference. After his sermon on the Fear of Man, my friends grabbed a few of the books, and so far as I know they’re loving it. I’m gonna be placing my order within a day or two, if it’s anywhere NEAR as good as the sermon than this should be a good, and overall extremely helpful read in that it would greatly help you to live out your faith fearlessly, with the knowledge that EVERYONE should know to get by in today’s extremely atheist world environment that so many of us find ourselves stuck in. This is extremely necessary for anyone, especially students, with how the school systems are being redesigned to completely push out Christ.